Effective environmental management is one of the biggest challenges faced by the public and private sectors today. Whether you are a local authority, small business or multi-national enterprise, we all operate in an increasing regulated environment and without access to the right information, operations and reputation can be adversely affected. Essential Environment Online has been designed to help businesses, local authorities and education establishments keep track of developments in UK and EU environmental policy and regulation. Providing clear, simple information and guidance at your fingertips, it is the only reference resource on environmental legislation you will ever need. How can Essential Environment Online help you? No jargon - Written in clear, simple language, Essential Environment Online cuts through the legal jargon to deliver essential information and guidance. UK-based, European focus - Covers UK-wide and EU legislation and practice, ensuring that you have the information you need for environmental compliance no matter where you are based. User friendly - A search function, bookmarking facility and hyperlinks to relevant external content will point you to the information you need when you need it. 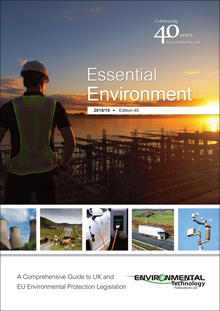 I highly recommend this latest edition of Essential Environment. It provides a handy and highly usable guide for the environmental practitioners,regulators and trainees who will help us to ensure a cleaner,less polluted, more resource efficient and healthier future for all. Concise, clearly-written and fully-indexed, the book will be of great value to those whose work crosses some of the least glamorous but most vital areas of environmental health – an extraordinary list that takes in pollution control, waste management, contaminated land, groundwater, shellfish beds and noise nuisance. It isn’t just a book for libraries, but a practical enforcement tool that, for many EHPs, will become a well-thumbed and indispensable daily companion. As ever, this excellent reference book and the online version which is continually updated, is a must read for environmental professionals. No matter the differences in legislation through the UK, Essential Environment ensures that we all work towards a cleaner, quieter, healthier and sustainable Scotland and our shared environment.